The third thing she told me was that life begins at 50. She said this just to me, out of earshot from my traveling companion, as she was tucking me back into the driver’s seat, right before she said, “I love you,” which is what she always said at the end. We had been together for four hours, first exploring her apartment, then gorging ourselves at Il Pavone Cucina Italiana, her favorite restaurant, and finally taking not the nickel but the full dollar tour of Rossmoor, her retirement community, with its swimming pool and yoga studio and land-locked Walnut Creek Yacht Club. She was mostly herself, full of restless energy, but with a jittery edge that hadn’t been there before. She repeated herself a few times, got flustered when she turned down the wrong hallway to get back to her apartment after lunch. I thought she was merely unsettled, still unaccustomed to her new surroundings after so many years of living in the same house, with the same routine, with Alfred, who was now gone. I also thought that the things she remembered were those elected of her own choosing, not because she’d forgotten anything but because selectivity was her privilege. After the tour and a quick stop back in her apartment (so she could give me a supply of calling cards and Rossmoor brochures to take back to the Memphis neighbors), she walked us to our car to send us on our way. We were headed to the Blackhawk Museum, which she insisted we visit, where we would buy model cars: a white Lamborghini, a yellow Corvette Stingray, a blue Shelby Cobra, and a red Ferrari, all selected by my traveling companion, who at the time loved nothing more than cars and who still has those same cars lined up neatly on a shelf in his bedroom. and then we went to the car museum where they had all these cool cars. That was a really fun trip. She was born in New York and raised in Abingdon, Virginia. At 16 she followed her beloved brother Bo to Duke, where she dated every Jewish boy on campus, all 49 of them. In the end, she broke Blue Devils rank and married a Tar Heel. They planted their mixed marriage in Savannah, where she blossomed as a mother, school teacher and cultivator of camellias and gardenias. Her husband died in 1972, and some time after his death Harriet reconnected with an old flame from Duke, who coincidentally had just gotten divorced. They had an epic romance, married in 1974 and in March 1983 bought a house in midtown Memphis, a new house on a subdivided lot, next door to an old spinster who in 2003 would sell that dark brick, ghost-riddled house (in which she’d been born) to an odd couple with two very small children, an infant girl and toddler boy. When we, the odd couple, moved in, in February 2005, my mother had been dead less than 6 weeks, and life was hard in a hundred small, insignificant ways. Harriet became a lifeline for me, as I’ve written before. And then Alfred died; and two years later Harriet moved away; and we all missed her, terribly. The part of her story that I didn’t know, the part she never told and that I would learn only at her funeral, was of her last years in Savannah, after her first husband suffered a stoke at age 42. She worked; she was a mom; she was a dedicated caretaker. Her life, for a while, was grueling. But at 5:00 every day, for five years, the doorbell rang, signalling arrival of a friend – a rotating group of friends – coming for a short visit, ostensibly for a glass of sherry but really to keep Harriet and her family going. At 5:00; every day; for five years. After her husband died, after she finished her mourning, a friend announced an upcoming trip to Memphis for a wedding. “I once dated a boy from Memphis,” she said. And then with a little help from friends and the universe, Harriet started over, at the age of 48. The mother-son trip to California arose from necessity. I was booked to speak at a conference in Sacramento, and Bernard was working nights. My daughter would be away at camp this particular week, but my almost-13-year-old son would, otherwise, be at home alone. So, we planned an adventure, a trip that would culminate with a visit to see Harriet, who 18 months earlier had left the little house next door to us and moved to Walnut Creek to be near her daughter and family. Our itinerary took us from Memphis to Sacramento through Chicago. A few minutes after the captain announced our initial descent into Midway, however, he came back with a change of plans. Air traffic was heavy in the Chicago area, and air traffic control had put us in a 30-minute holding pattern. The problem was that we didn’t have enough fuel to stay in a holding pattern for half an hour, so we were diverting to Indianapolis to fill up. By the time we finally got to Midway, we’d missed the last connection and had to spend the night before catching a 5:30 a.m. departure the next morning. My son started grousing about why bad things always had to happen. Oh, come on, this will be fun, I told him; how many of his friends could say they’d spent the night on a cot at Midway’s Gate 3A and gotten to take home their own little bags of toothpaste and hand sanitizer? He wasn’t convinced, though he did shed the cloak of defeat when he saw we were among the first to reach the sleeping quarters. We arrived early enough to get the spots by the wall that had electrical outlets, and that was enough to suspend unhappiness temporarily. The rest of the trip went off without a hitch. We stayed in a boutique hotel in Sacramento, around the corner from a French pastry shop that made thick coffee and tart lemonade and airy macarons and silky pain au chocolat, meaning my traveling companion and I had everything we needed, almost, and all within reach. During the two days of the conference I bobbed back and forth between the meeting rooms and our hotel room, where my son stayed in bed and ordered room service and watched the live stream from E3 on my laptop. On Friday morning we walked to the Avis lot, a box of assorted macarons in hand, and then headed out I-80 driving a beige Corolla, not (sadly, from my adolescent companion’s point of view) the bright yellow Mustang parked next to it. 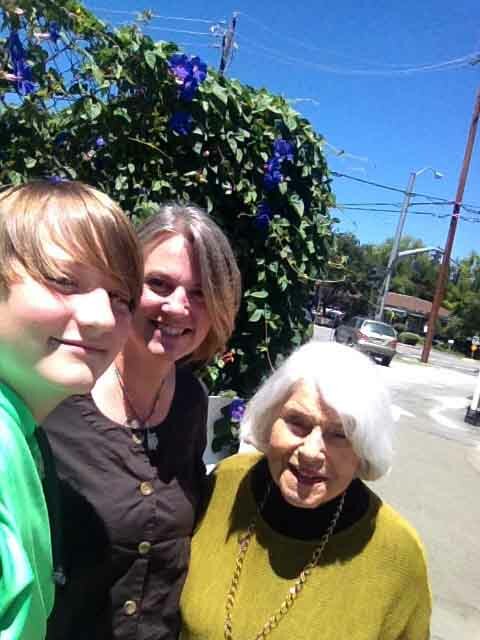 When we arrived in Walnut Creek, Harriet wanted us to see every part of her new life but also to make clear how much was the same, though now in a different location. An inch at a time we combed through the small, cozy, one-person apartment she’d arranged with her most cherished art and favorite books and comfortable leather furniture. She said: Now, of course, you remember [this book, this painting, this picture of Alfred, this gift from the Podestas]…. Of course I remembered very few (if any) of these things, but I did my best to play along because all of the memories were important to her, and she was important to me. The very last thing she showed us was her bedside table, covered with books and reading glasses and a pretty lamp. She opened the small top drawer and extracted a folded piece of paper, a printed copy of the post I’d written when she moved away in January the year before. She said: I read this almost every day, you know. This continued to be true, her daughter would later tell me, up until Harriet’s death. Over lunch she told the most daring adventure stories she could think of, noting from time to time that she knew it was hard to be a 12-year-old boy having lunch at a fancy restaurant with an old lady who talked a lot. So she would tell a story and then ask him for one in return; any story would do – about math or skateboards or video games or fast cars or the other children on the block back home. He told her about the mishap at the airport, and she said that you know it’s going to be a grand adventure when it includes a good mishap, like the time she broke her arm on the cruise ship, which turned out to be one of the very best trips of all. And then she turned her attention to me. Was I still writing? because that was important; writing was something I should do. And were we taking good care of each other? because that was important; taking care of each other was the very most important thing of all. Now, there are two things I want to tell you: First, you are a good mother; don’t ever doubt it. Second, gray is the new blonde; and I love that you’re embracing it. I do think you might consider lipstick, though. Lipstick makes everything brighter. And that was the last time I saw Harriet Green Marks Alperin, whom I loved quite dearly. As her obituary noted, Harriet was the longest surviving past champion of the game show, The Price is Right, having been a winner in its inaugural year of 1959. She was a life-long learner, voracious reader, and devotee to the Sunday edition of The New York Times. Under her fun and flighty demeanor she was sharp as a tack – nothing escaped her notice. This is why, I suspect, the signs were so quickly apparent. Harriet had Lewy Body Dementia, a horror (as Harriet’s son said) no one would wish on his or her most despised enemy. At her funeral the people who knew Harriet best talked of how she sparked joy in everyone she met, of how the world had lost a spark of life in her dying. It’s true; she did ignite something deep inside each and every person she collected along the way. To name it only joy, though, is not enough for me. Harriet seeded belief, a source from which strength, courage, love, wisdom, comfort, happiness and, indeed, joy could sprout. She endowed us with permission to claim our own hidden treasures. It was her greatest gift, evident enough while she was living, and abundantly clear in retrospect. The third thing Harriet told me, the last time I ever saw her, right after she suggested lipstick and before she said a final “I love you,” was that life begins at 50. And I believe it. What a beautiful tribute! No, I’m not crying! YOU’RE crying. Yes, the onions! That’s it! Oh! I read her obituary in the Tennessean a few days ago and was completely taken by her. I think I would have liked Harriet a lot. I am delighted to read your memories about her. She sounds just as great as I was hoping she was. I’m sorry for your loss. She was utterly wonderful. You would indeed have liked her at least a lot, and probably a great deal more. She’d have done the same in return; that’s how she was. Thanks for your kind words. My parents were Alfred and Harriet too. She sounds delightful. I am sorry for your loss of such a dear friend. I agree about the lipstick. She was dear and will be missed. If she were still here, though, she’d probably say 90 years with her faculties intact was a sufficient and wonderful run. I love that your parents were Alfred and Harriet! Oh, what a dear and lovely thing, this friendship between two such strong and interesting women. I went back and reread your earlier piece just so I could see what a wise and elegant woman keeps in her bedside table. Loved that, too. I am so sorry for your loss but grateful for your sharing. Such an amazing woman. Harriet, Big Don, Astrid. I fall in love every time with the complicated, engaging, generous spirits you gather among your memories. I want to aspire to and laugh with; have lived among and been known so lovingly by such colorful characters. I suspect you have many equally wonderful, colorful characters in your world. I hope this is true – for you, for all of us, always. Just sent you an email… really hope we can make this work and connect! Next article 20 things I could tell you.